This retelling of the poem by Henry Wadsworth Longfellow, starts with O Kagh (Graham Greene) guiding a French trapper Bertrand and priest Marcel to a meeting with the legendary Ojibway leader, Hiawatha. O Kagh says "Everybody knows Hiawatha, just nobody ever met him.” The trapper is looking for furs, and the priest is looking for souls. The group meets Nokomis Hiawatha’s grandmother and Iagoo, who helped raise Hiawatha. Nokomis has no use for the priest or the trapper but Iagoo starts telling stories of the now almost legendary Hiawatha. He says "Hiawatha is a blessed child. A child of wonder. Hiawatha is favored by the spirits from the time he was a little boy. As a boy Hiawatha was always better than the others. Faster, stronger, smarter too. Back in those days were times of war, tribes killing other tribes for feuds sometimes so old nobody remembered what started it." Hiawatha is taught the ways of the forest and hunting and the ways of war. He becomes the youngest war chief ever. Hiawatha asks his grandmother about his parents and she tells him the story. His father Mudjekeewis (Russel Means), is a god who left his mother, who died of a broken heart. Hiawatha travels to the Kingdom of the West Wind in the mountain where his father lives, vowing to kill him. Mudjekeewis tells him about the immortals and about his mother. He tells Hiawatha that they spent a summer together, but he was not able to bring her back to the mountain with him. Hiawatha tells him he must kill him for turning his back on her. They battle and Hiawatha grabs a magic rock and hits his father with it. Mudjekeewis then appears in the sky and tells him to go off and earn his immortality. He rescues Chibiabos (Adam Beach), a member of the Seneca tribe, from drowning and they become friends. Chibiabos is a poet and a singer. Chibiabos brings Hiawatha to meet the beautiful Dakota girl Minnehaha, who has a sharp tongue. Her father says: "This girl with the raspy mouth is my daughter, Minnehaha." He goes on to say: "I named her after the falls of Minnehaha, for their beauty and sweetness of the water. The beauty's one thing, still working on the sweetness." Hiawatha vows to come back and make her his wife. Hiawatha and Chibiabos travel many days back to the Ojibway nation. Things are not good, and there is not much food. A warrior wants to lead them to war to get the food from other tribes, but Hiawatha sees a better way. He goes on a spiritual quest, meets a spirit, and learns the lesson of how to grow corn. Nokomis tries to fix up Hiawatha with a Ojibway girl, but Hiawatha's heart is set on Minnehaha and he goes back to get her. Back at the Ojibway tribe, there is a conspiracy to kill the returning Hiawatha, as a warrior who wants to become war chief tells the Mandans about Hiawatha's return route. With his war club and hatchet, mighty warrior Hiawatha kills the Mandans. Hiawatha stops Minnehaha from killing the Mandan chief, because he tells her it will just lead to more killings. We then see Hiawatha and Minnehaha eating corn with the Ojibway in a lodge. Nokomis accepts Minnehaha in to the family. 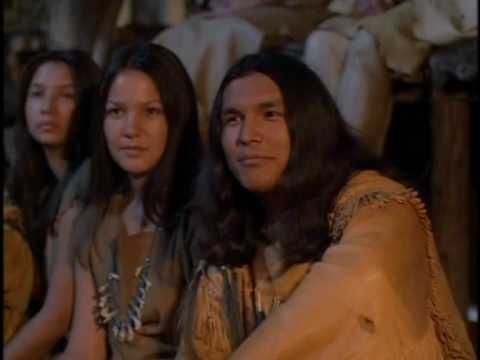 The movie then breaks out of the flashbacks and we again see Nokomis and Iagoo with the trappers and priest. The priest begins to question whether the Indians may not already be in good hands. "Hiawatha, Son of a god and a mortal woman. Sent to save his people, who fasted and then brought food to the multitudes." He goes on to say: "It was said that the Redeemer would come again, was it not? Is it not possible that he chose not to visit a Christian land the second time." Back to the flashback and we hear another story about the heroic Hiawatha as he battled the evil magician Pearl Feather. While he is away, one of Hiawatha's enemies tries to assault Minnehaha and she is injured. When Hiawatha comes back Minnehaha has lost her baby. Hiawatha then sends out messengers to the Delaware, Mohawk, Huron, Blackfoot, Mandan, and Dakota. He told them that the Great Spirit was weary of watching them fight among themselves. He tells them there is strength in peace. While he was speaking lightning bolts come from the sky. Hiawatha became known as a hero and a peace maker. But Minnehaha couldn't have children and then she falls ill. Hiawatha asks his father to save Minnehaha, but she still dies. Hiawatha takes leave of the people, largely because of what the white people are bringing. He sees the end of the peoples way of life. So Hiawatha never meets with the priest or the traders, because he sees that their arrival signals the end of a way of life for his people. This is a movie that is much better than its rating. I don't know why it is not much more popular. It uses native actors, it is very reverential of native spirituality and I think it is very well done.